Whether you are brand new to WaterFed® or have been using pure water technology to clean for years now, the innovation of WaterFed® and the science and technology behind using pure water to quickly and safely clean windows is still relatively new to the window cleaning industry. This guide covers how to choose which WaterFed® pole(s), sometimes called Water Fed Poles, Water-Fed Poles, or even Water Feed Poles, to purchase when getting into pure water cleaning. We'll cover the most important characteristics so that you can make an informed decision! Not sure what WaterFed® is? Read this introduction first. What Length Of Pole Do You Need? The first step is to determine the pole height that would best suit you. To do this, look at your current jobs and determine the highest window you'll need to reach. Once you have an idea in your head, consider the angle the pole tilts against the building, as well as the possible flex that may occur. To add enough length so that your pole perfectly reaches the windows you have your sights set on, multiply the height of your highest window by by 1.2. This number will add just a few feet, but will be enough to compensate for the pole’s tilt and flex. Now that you know how high you need your pole height to reach, you’re well on your way to the next step in choosing your WaterFed® pole, but you’re not there yet! Check to make sure the pole height is being shown in actual length, as opposed to working height. For example, we list our pole lengths actual length, meaning a pole that is listed as 45 feet is actually 45 feet, top to bottom. 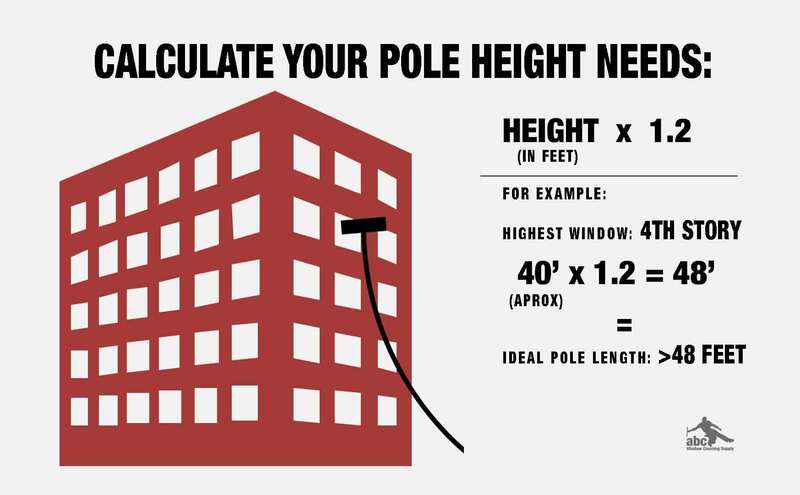 Working height, on the contrary, factors in how high you'll be holding the pole from the ground, meaning a 45-foot pole might actually be 43 or 42 feet. It’s important to know which is being listed so that you can compare poles accurately and so that you can know how much reach you actually need. The first characteristic is, of course, your budget. After all, chances are you are interested in a WaterFed® pole for your cleaning business and money is usually the bottom line (well, that and spectacular cleaning results, but your WaterFed® system will be sure to take care of that). The next step is determining how much flex you can work with. The higher up your pole will be working, the more important flex becomes. A significant amount of flex can make a pole harder to work with. All poles will flex but the higher grade materials like carbon fiber keep it to a minimum. The last attribute is how much the pole weighs. Of course, a lighter pole is easier to work with since you'll be lifting it all day. Saving a pound can be significant when you raise and lower it 1,000 times. Since all three of these characteristics are so intertwined, something’s gotta give. 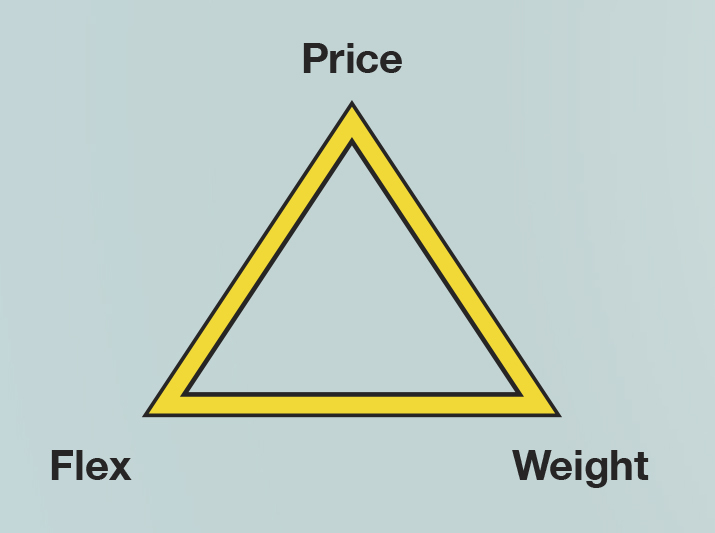 Use this triangle we created about WaterFed® poles to help sort out priorities. For example, if you budget requires an economy pole and you refuse to work with a pole that has extreme flex, your pole will most likely be on the heavier side of things. But, if you can’t imagine working with much flex or weight from your pole, you are most likely looking towards a higher end pole, aka not cheap. The biggest contributing factor is determining what material your pole will be made out of. These poles are cheap but are heavy and will give you issues with flex above two stories or so. This type of pole is the most common telescopic pole used in traditional window cleaning since you aren’t normally going as high. When using this type of pole for pure water cleaning, on the contrary, weight will be a problem and flex will become unmanageable over about two stories. The time and effort it would take to control an aluminum pole higher than about two stories would essentially cancel out the time and effort saved by cleaning clients windows with a WaterFed® system. 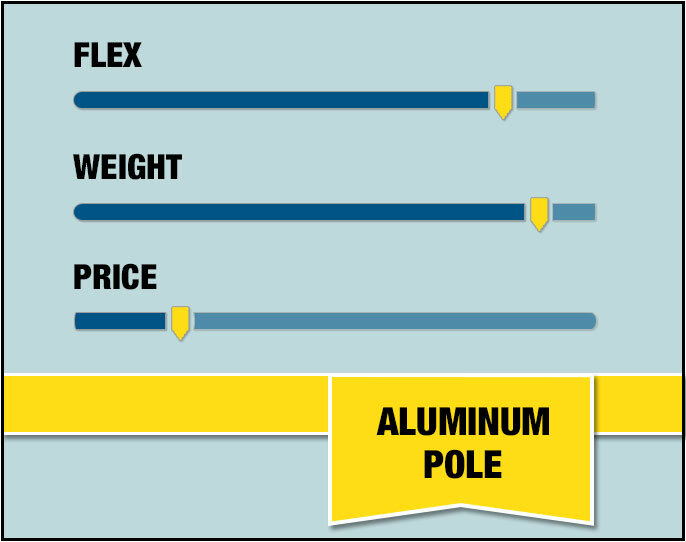 Note that traditional aluminum poles generally use Acme threads. Most Water Fed accessories (brushes, goose necks, etc.) use European threading. These aren’t compatible, so you’ll need an adapter like our converter kit. Fiberglass WaterFed® poles used to be the standard beginners’ pole. They are a bit more expensive than the aluminum pole, but offer significantly less flex and are much lighter than an aluminum pole. They are particularly ideal for those new to WaterFed® users because they are much less of a financial commitment than other WaterFed® poles, but are still made from materials that is cater to pure water cleaning systems (meaning they are still really light and offer a controllable amount of flex when they reach above three stories). 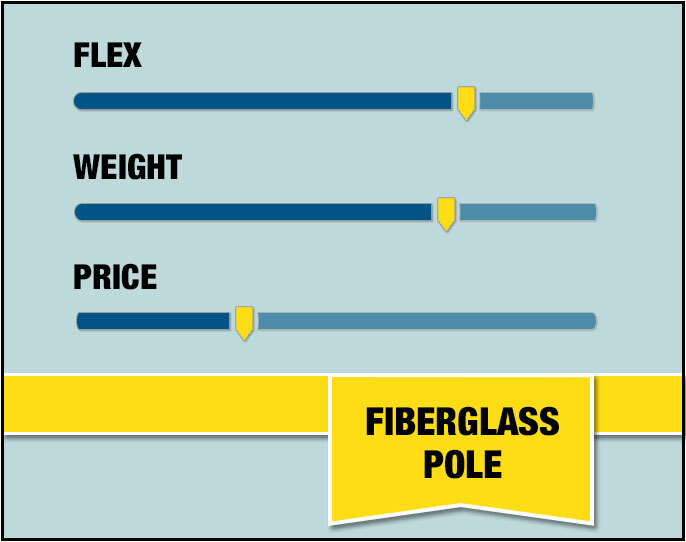 Fiberglass poles generally max out around 3 stories before flex becomes a significant problem. They are becoming less popular because hybrid poles have become less expensive over the last few years. Poles made from “hybrid” materials, refer to a mixture of fiberglass and carbon fiber materials. 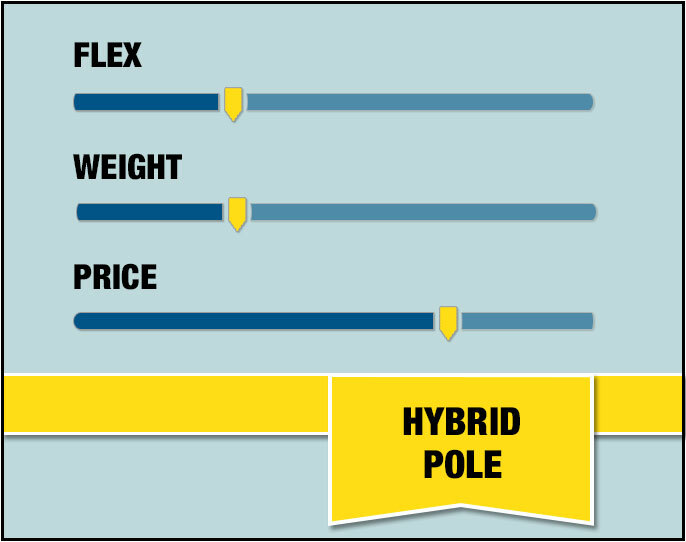 In other words, they use the materials from our two other poles, to create this hybrid pole that offers less weight and flex than the pure fiberglass pole, but is not the financial commitment that a purely carbon fiber pole can be. We recommend this type of pole for those beginners that are serious about adapting WaterFed® cleaning, or those who have some WaterFed® cleaning experience and are ready to take the next WaterFed® step (aka use it quite frequently). Hybrid poles are ideal up to about 4 stories. 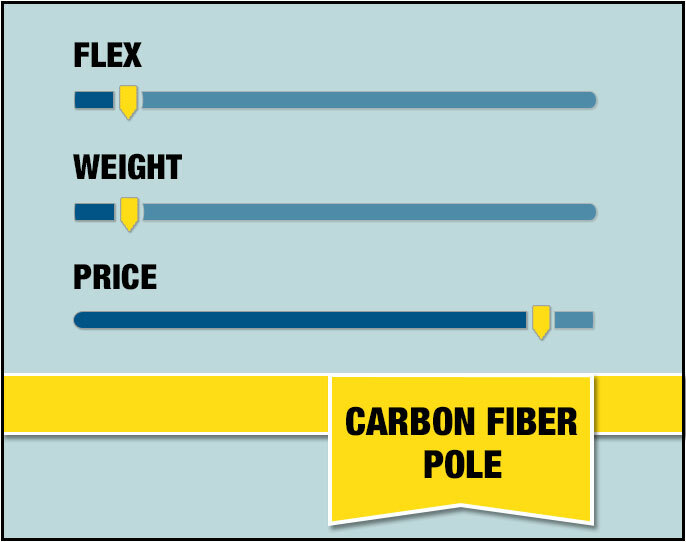 Carbon Fiber poles are the highest quality materials used in the market for WaterFed® poles. These are the poles that are going to allow you to reach incredibly high, with relatively minimal weight and significantly more flex control. There are a few different types of carbon fiber that you will see on the market. Things like High Modulus carbon fiber are just a higher grade of carbon fiber, meaning even less flex. 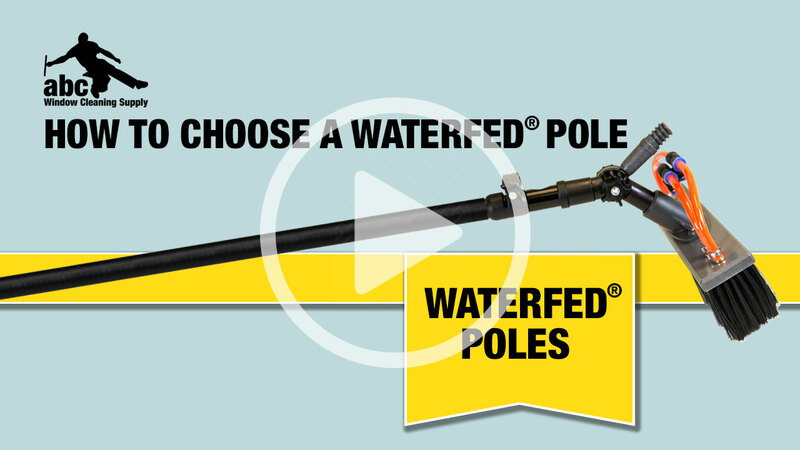 The next step in finding the WaterFed® pole that is right for you is to decide between a telescopic pole and a modular pole. All this refers to is how to pole itself is designed to extend. Telescopic poles are the most common type of pole. This means that all of the sections of the pole are inside of each other. To extend your pole, simply adjust the collars, extend the sections, and tighten the collar back down to hold the sections in place. This methodology is wonderful for its quick versatility. A modular pole, on the other hand, does not have its sections stacked inside one another, but rather each section stacks on top of one another. This can reduce the weight of the pole when you don't need the full potential length. For instance, if you have a 45 foot pole and you’re cleaning second story windows, rather than holding the extra sections, you can simply take them off (you can also do this with a telescopic pole, it's just not as easy). This also allows for as much additional length as the materials’ flex will allow since you can just keep adding sections. There is also the option to get a combo pole; you can probably guess what that means at this point. A combo pole is a telescopic WaterFed® pole until a certain point, and from there extension pieces can be added to the bottom to give the pole additional height. It really is the best of both worlds, cleaning lower window using the telescopic feature, then simply adding modular sections to increase the poles height when required for higher windows. It’s also worth noting that you can remove sections on telescopic poles to reduce the weight of the pole when you don’t need the full length. It’s not as easy to remove sections as it is with a modular pole, but it’s a fairly simple procedure. When adding and removing sections, you'll run the pole tubing on the outside of the pole rather than up through the inside. You want to take into consideration the height of the pole while it is completely collapsed. If your pole is too tall, it can be vehicles. On the other hand, when a pole is very short, it will often have many sections to make up height. This can mean the diameter of the bottom section is quite wide, like holding something the diameter of a soda can, which can lose its appeal on a long day. Again, not a game changer, but something to be aware of. Many poles include extra bells and whistles to make them more appealling. Handles, hand adjustable collars, section covers, and the like. These are useful features but make sure that they aren't the basis for your decision. The attributes discussed above are by far the most important factors in deciding which pole is right for you.